So Who is @TraciHines ? Well @KorEvil2013 lets you know! The Red Head you'll fall in love with! So just got done watching a hell of a music video that, if you like Disney movies like the old Disney movies we used to watch when we were younger, then you will love this. 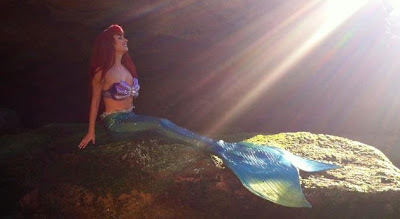 The music video is called "Part of Your World" and is was sung but a talented women by the name of Traci Hines. I hadn't heard of Traci until I came cross a video called "Hipster Mermaid Teaser", which is a teaser for "Hipster Mermaid". Of course if you know me, you know what drew me into the video, the red hair. I swear people the end of me will be a redhead ha ha. 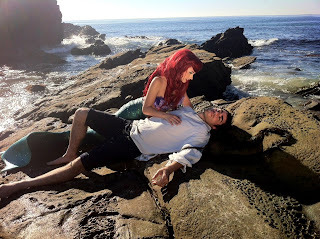 Anyway, this video definitely brought back memories of watching The Little Mermaid for me. Yes I've seen The Little Mermaid, I was a child of the 90s people. I thought it was shot pretty well and the setting looked magical. I mean whoever did the edit work did a damn good job. Besides all the tech stuff, I really love Traci's voice. 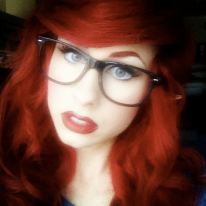 I mean if they made a live action Disney Little Mermaid movie I would want her as Ariel. I mean they would be crazy to pass her up as Ariel. Over all I feel that Traci Hines is going to have a long career in music, acting, modeling, or whatever else she does. She definitely has the following that goes far and I for one look forward to seeing what else she does. Lately I haven’t really had time to go back and keep up with Traci Hines and what she’s been up to. I did how ever ask her to do an interview with me on The Evil TeddyBear Podcast but her response, “Send me an email and I’ll consider it”, which is basically like saying “no” to me. Even though that was her response to me, I still find myself digging her voice. I’m waiting for the day that I can go and pick up my full Traci Hines album. She is definitely the chick to nerd over and geek over. Another thing I never mentioned before is the fact that she definitely seems to have a big love Disney movies. If you go on her YouTube page you can see how much Disney is put into work. I mean I was going back to some of her older videos and this girl has not only dressed up as Ariel from the Little Mermaid, but also Belle from Beauty and The Beast, Cinderella, Snow White, & Jasmine from Aladdin. I for one love the fact that there are still people out there who geek over the older Disney movies but its rare to see any people around my talk about that stuff. Anyway to see more of Traci Hines please visit all the links below. Also don't forget to check her out in Bad Wolf's music video for A Better World.